The Morning Walk and Sunrise. 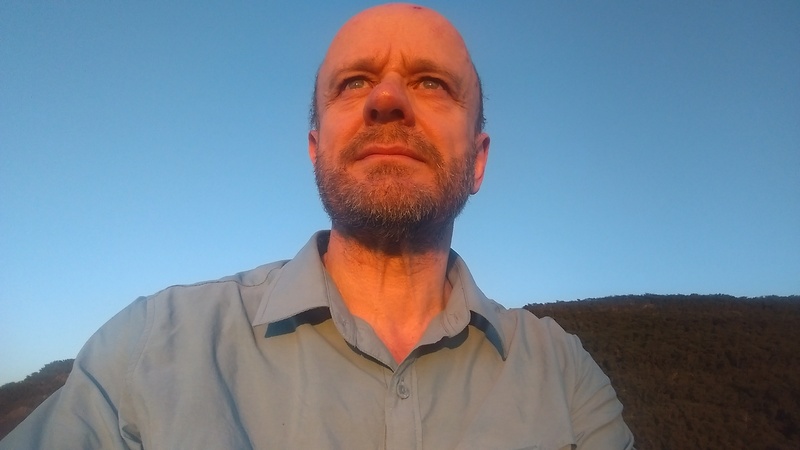 An early morning walk is always good – however I must admit to a certain level of madness to be walking in the hills before dawn. The rewards are quite stunning. My watch started vibrating right on 6.00 a.m. I was already awake, lying there waiting for it to go off. It’s important never to get out of bed before the alarm goes off, it’s a universal rule and as I will show, universal rules are not to be toyed with. I turn the light on, stumble around the room, find the suitable attire that I’d carefully laid out the night before, brush teeth, beard and hair, throw some items into the backpack and head out the door by 6.10 a.m. It is dark. The stars remain bright, overhead is Spica with Jupiter sitting next to it, well, at least in my sky, there’s really 550 light years between them. There’s also Antares, I mistook it for Mars as it’s red, next to it is Saturn. The sky to my east is starting to brighten as I head along the footpath through the middle of Halls Gap. My only company is the kangaroos and wallabies who are enjoying nibbling the grass without hordes of tourist hanging around trying to get close enough for a photo. In a couple of minutes I have crossed the little village, moved beyond the football oval and begun the climb upwards towards Chatauqua Peak. It’s only a short walk, about 3½km. The track is a sandy white, it stands out in the pre-dawn light, however it’s dark away from the village lights, and before long my toes are hitting every rock and tree root, causing me to stumble. Last thing I need is to be rescued by the SES before I’m even out-of-town. Luckily a thousand years in the Scouts taught me to be prepared and I whip out my headlamp, remove my cap, attach said light to my head, slap my cap back on, turn on the light and continue upward. As the blackness gives way to an eerie grey, the birds start to awaken, first kookaburras begin the morning with a solid round of laughter from all directions. Like a real laugh it seems contagious and in a few seconds I’m surrounded by the calls of the early birds. The currawongs aren’t far behind, their distinctive call bounces around the mountains. The magpies join in with their early morning warbling, like the kookaburras it seems contagious and soon there seems to be hundreds all speaking to each other. Throw in some ravens and lots of small wrens and we have an orchestra of morning song. However, nothing compares to the awaking of great flocks of cockatoos who begin their morning by screeching to each other. It’s like a 3 year olds birthday party, everyone wants to play with the new toys now and they’re all going to yell until they get their own way. Now that’s a sound that really bounces off the mountains. I can’t tell now if my headlamp is getting dimmer, batteries running down, or the encroaching daylight means it’s less effective. As it’s now light enough to see, I turn it off and continue the trek and manage not to stumble so much. Still to early to be rescued, I’m still in mobile phone range. As I ascend the sky to the east has a bright orange bubble in the middle of a grey sky, the west is still black. As far as I can see there are no clouds in the way. The stars don’t fade away, they simply wink out of existence, all the background stars disappear as the sky changes from black to grey as the light extends from east to west. If I’ve timed my walk right, I should get to the rock hopping stage of the walk in fairly good light. I know I’ve been rushing a bit, sunrise waits for no person! As I get to the fork in the track, I pause to look eastward. The orange now extends across the eastern sky and I can pick where the sun is going to pop up. I’m a little worried as I think it might be behind Boronia Peak and I’ll miss day break. I’m now on the final stretch, it’s 6.50 a.m., I’ve made good time and can slow down a little. This bit of the walk is along the ridgeline and there’s not a lot of space between me and the edge of the cliff. The light is good and I hop along the rocks with ease. I reach the summit of Chatauqua Peak just after 7.00 a.m., I’ve got about 15 minutes before the sun rises above the horizon. I drag out my phone and fire up Sky Maps, I want to be sure I’ll have a clear view of the right point. I can see that Mercury has just risen on the map, alas, the sky is already way to bright for me to see it. I have a clear view of the horizon, a few low hills on the edge, but that won’t matter. I eat an apple and wait. I mean, what else can you do while you wait for the universe to spin around? I snap a couple of photos. The mountains to the west change colours from their nighttime muted tones to a soft orange colour, the trees that spill around their bases a dark green with spots of moving white as the cockatoos take flight. The eastern sky is blue with an increasing orange bulge in the middle. It’s 7.16 a.m. This is the time that has been allotted for our nearest star to put in an appearance. I know this, because I asked Google. It’s the only conversation I’ve had today. I said “Sunrise” she said “The sun will rise at 7.16 a.m. in Halls Gap” and went quiet, not much for small talk, either of us. And there is the proof of the final universal adoption of Google as the holder of all information. A bright orange light appears on time and in the place that Google said it would. The little bit of the sun quickly turns into a huge ball of glowing orange, within moments it’s too bright to look at. The world is suddenly bathed in a fantastical hue (I’m trying to avoid using orange again), the high peaks behind me are bathed in a warm glow and this shows off the brilliant whites and reds and all the colours in between. Now with the sun fully risen I snap a few photos of the daily spectacular. I have no idea what it is about sunsets and sunrises. They happen on a continuous basis, as the earth spins there is always one of each happening somewhere on the globe. Yet, every single one of them is unique. It is its own moment. This one feels richly deserved, I’ve climbed a mountain, well, a peak. Risked life and limb to reach the summit in time to see this daily event on a beautifully clear night that is then pursued by a beautifully clear day with a brilliant blue sky and a now white star marching across it. It is a moment of renewal, it reminds me of the daily grind of the world and how each day starts afresh with a world of possibilities. Today is a day for me to renew, refresh and start again. Below me I can see the long shadows of the trees in the brown paddocks, reminding me that the seasons are turning and it won’t be long before summer ends. 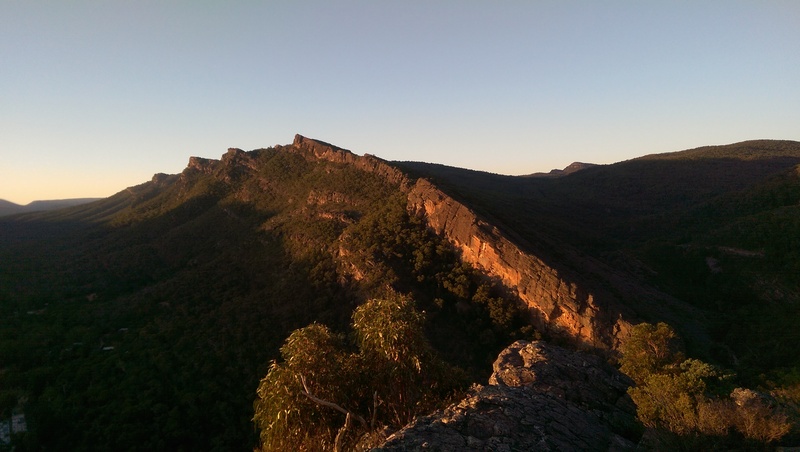 The sun is yet to reach the Fyans Valley in which Halls Gap sits, it’ll be another hour at least before it peaks over Boronia Peak. I start my walk downward, within a couple of minutes I’ve dropped below the peak and into the shadow. 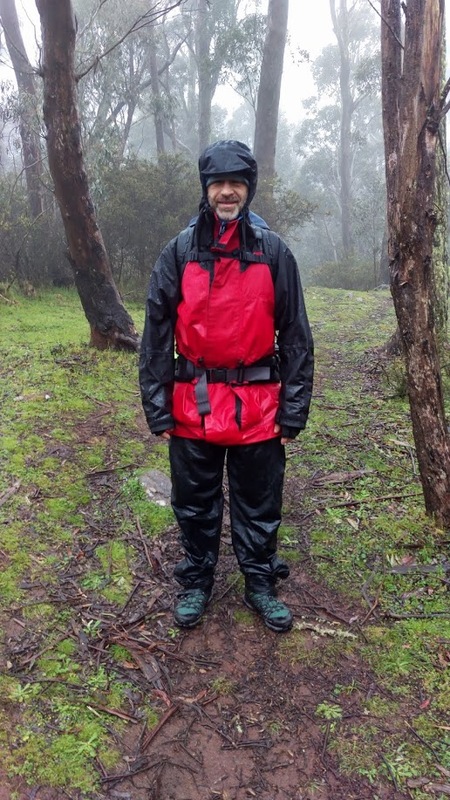 It’s still cool here and I meander down to Halls Gap where coffee and breakfast calls. Not one for small talk. Click all the images for a better look! 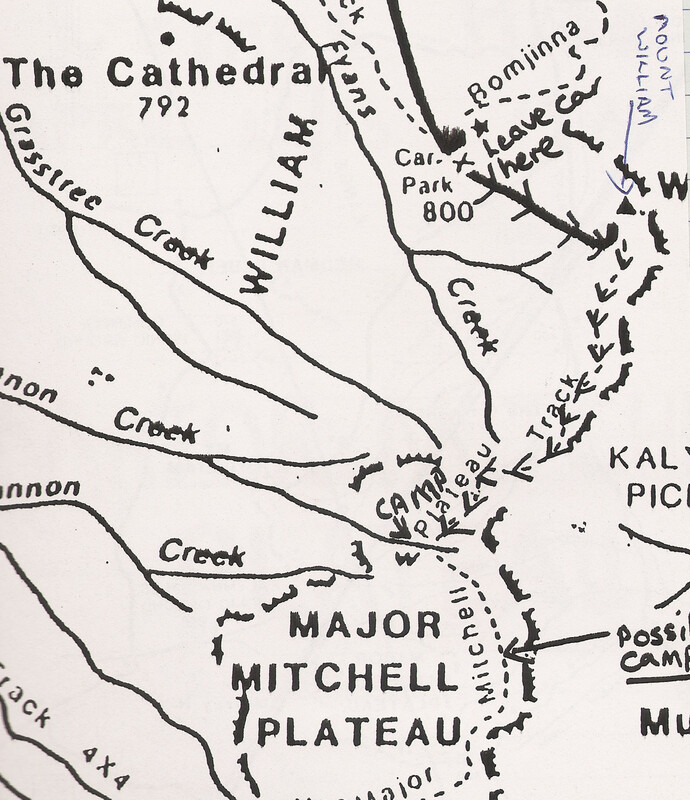 I first donned a backpack and climbed the Major Mitchell Plateau in September 1985, I’ve climbed it a total of 4 maybe 5 times now, including the latest hike in 2016. A lot has changed in our world since then, firstly the medium of recording the story. I can’t find my log book for 1985 or I simply didn’t have one. However, my second hike in 1986, dubbed the “Comet Hike” was written in my log book that was a foolscap Collins Minute book. Written after the event. 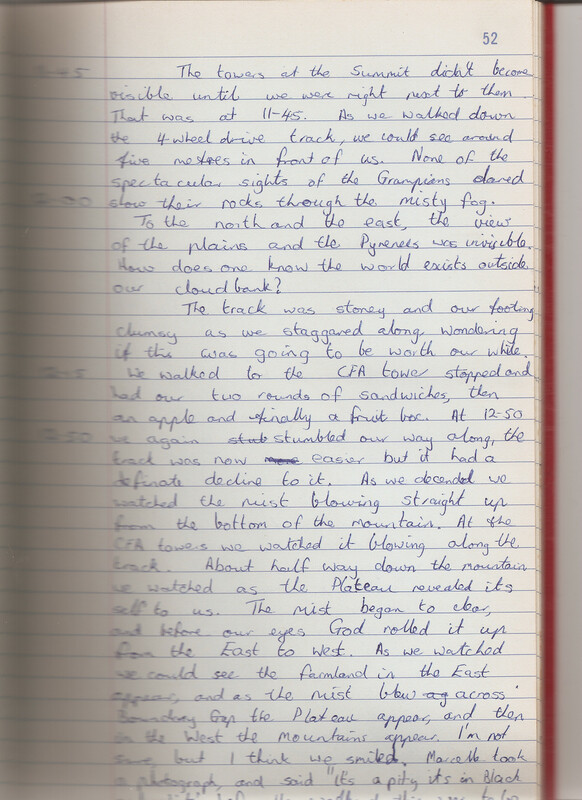 Not long after that I started recording in a smaller log book that I carried with me and wrote every chance I had. These days my rough notes become a word press blog and I share the story with lots of other people! In the 80’s I would use my log books and diary to record daily life and then record letter tapes for my friends. The invention of word processing on a typewriter and then computer also means that my spelling is checked. I also have Michael who proof-reads for me! Other changes. Get a load of the car, it’s an HQ Belmont station wagon, not a Kingswood and the rear door has a roll down window and drop tray! Click on the image, Marcelle and I both have mullets and we’re both wearing our scout uniform. For whatever reason we thought these heavy cotton shirts were the go for hiking in. 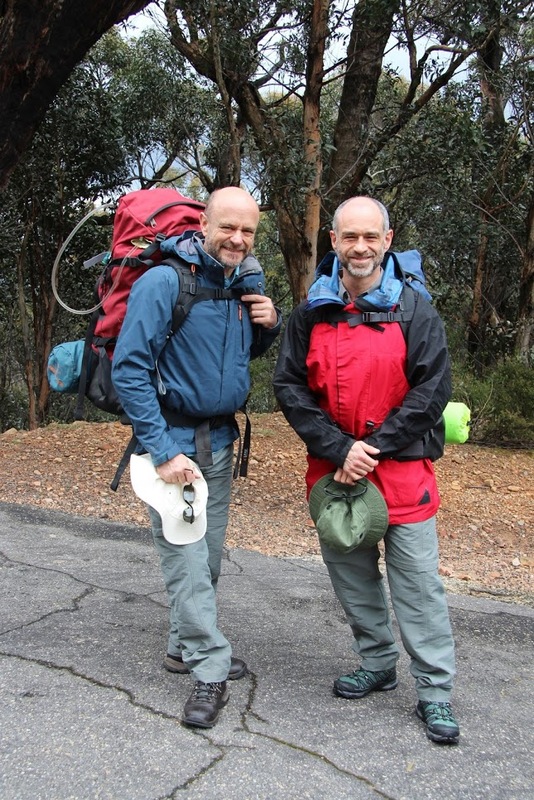 In the other photo we’re dressed in special hiking gear, our shirts have special wicking abilities, we have decent boots and Goretex raincoats. Marcelle’s backpack is the same one that Michael is carrying, however, check out my old one. It has an external frame and you can see the aluminium hoop at the top. That bloody thing use to snag on every low hanging branch I passed under. You can still buy the sleeping mats, a single piece of pressed material, nowadays you wouldn’t use them as a yoga mat. 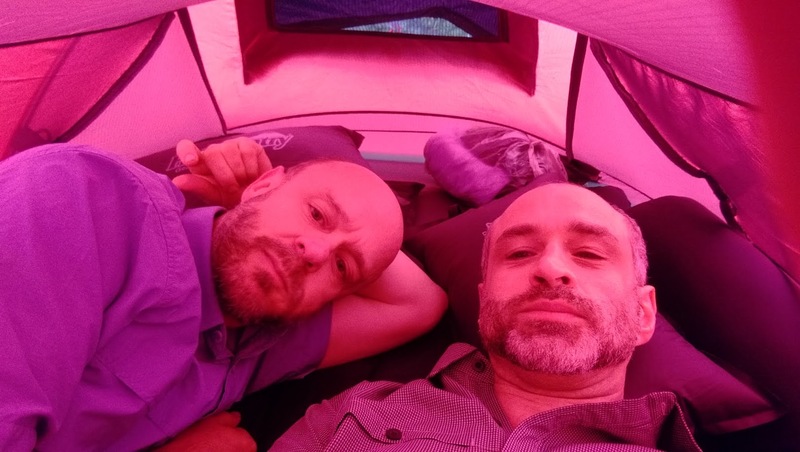 We travelled with lightweight self-inflating mattresses. However, mine had a seam explosion so I would have been better off with nothing more than a sleeping mat. 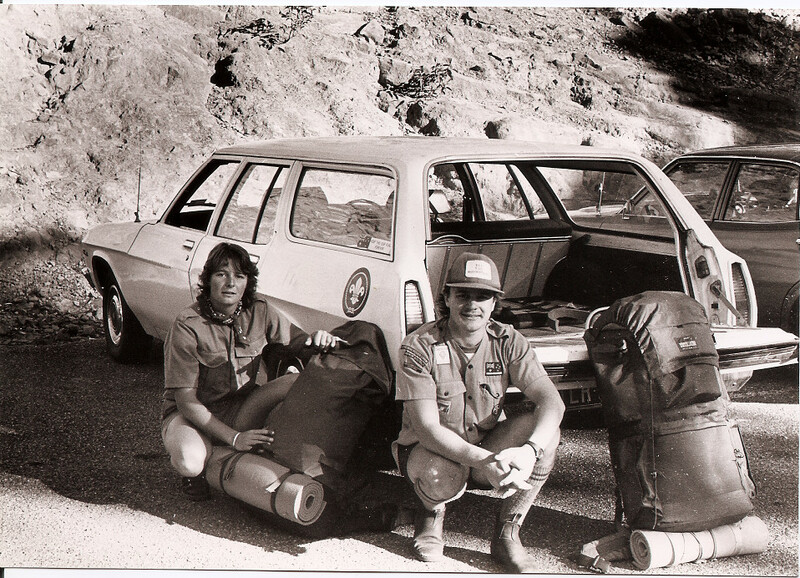 We spent hours packing in the 80’s trying hard to get the packs as light as possible, these packs had about 16kg. 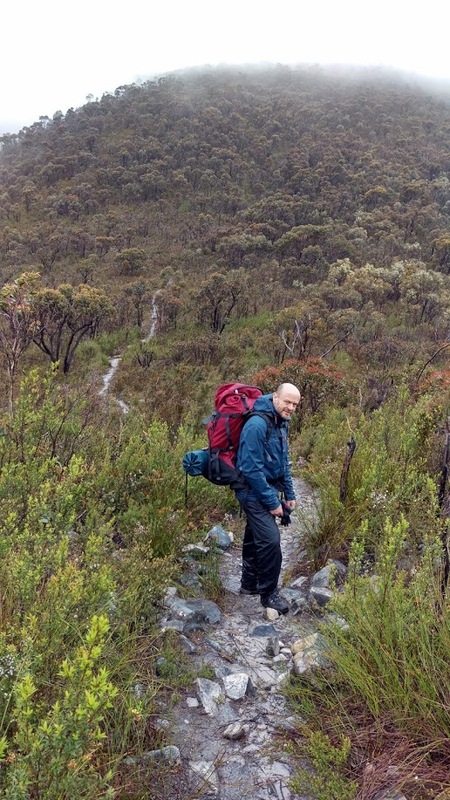 I carried 18kg this hike, so a little more but a lot less time to pack. In the days before colour photo copiers we carried two A2 paper maps that were very detailed. If we wanted to check where we were we needed to triangulate our position, so needed 3 landmarks within sight, and using a compass, rotate the map, draw 3 lines and basically have a guess. 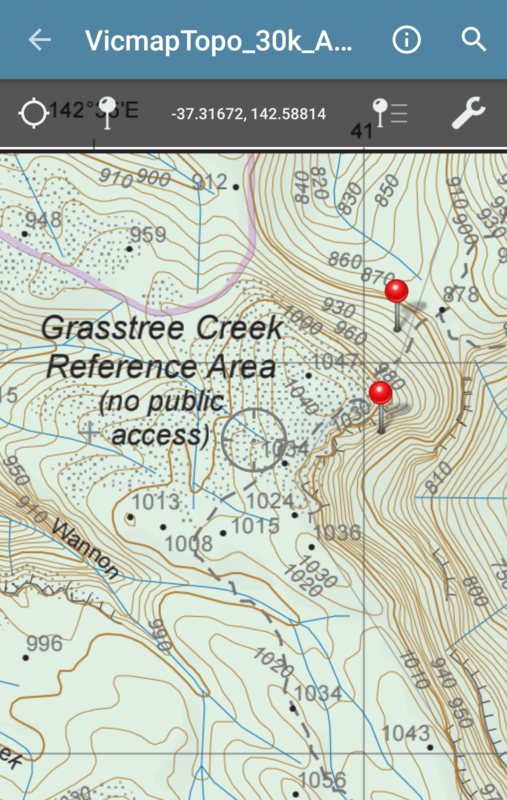 The information on the maps was already 10 years old when we bought them. In 2016 we downloaded an app onto our phones, paid $9 for 3 maps that has information that is regularly updated. The app even puts a little blue dot to show us where we were along with the full longitude and latitude. There’s no need for wi-fi or mobile reception, just the trusty satellites overhead. We could zoom-in for a closer look, or out for a wider look and drop a pin, here’s where we had lunch and where we camped. We printed the maps out in colour to carry a paper copy and gave a copy to various people in case we got lost! Cooking has changed too. 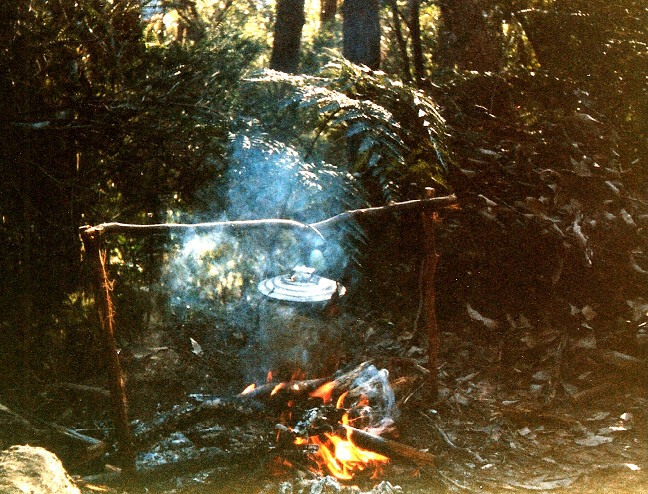 Here we are with a fire and a billy hanging over it on a structure we’ve fashioned out of sticks, compare that to our lightweight cooking pan sitting on a tripod above the flame. No need to search for dry wood. 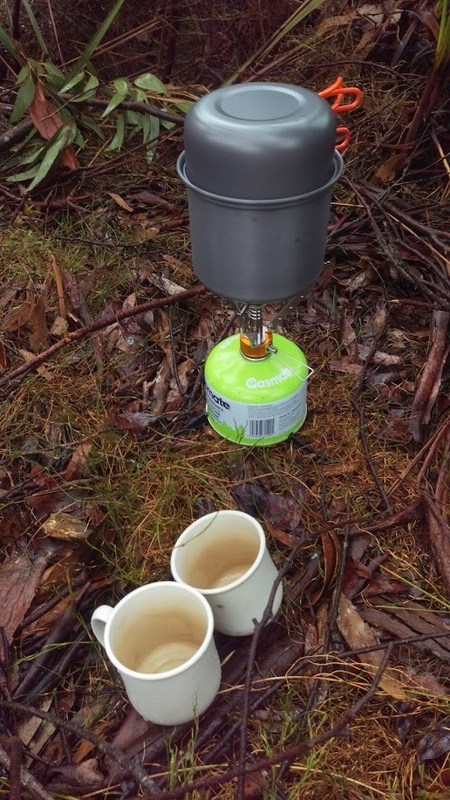 Still, once the matches got wet, even though they were waterproof, no fire was possible! The menu in 1986 consisted of fresh hamburgers, dried peas and Deb potatoes, sandwiches and pikelets. In 2016 we had fresh fruit, freeze-dried chicken and potatoes, along with packaged rice and salmon. Luckily the taste of freeze-dried food is much better! And then our sleeping accommodation. 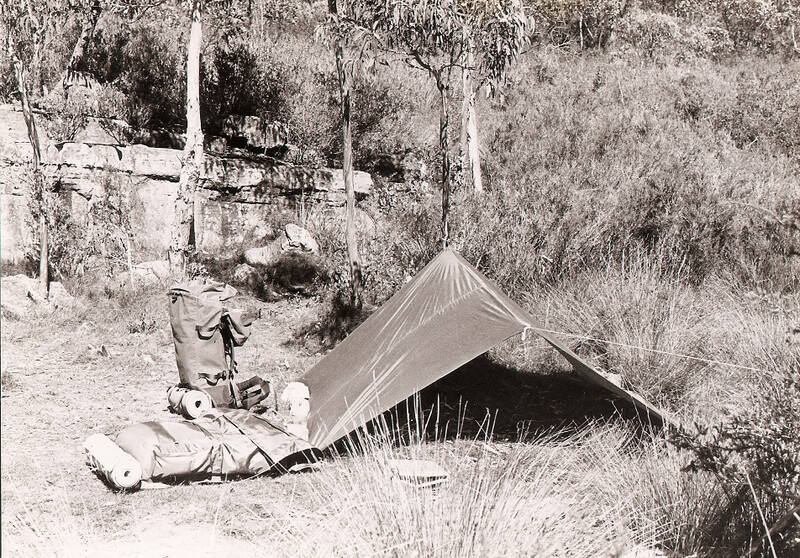 In 1986 we wanted to go as lightweight as possible, so slept only under a tent fly. 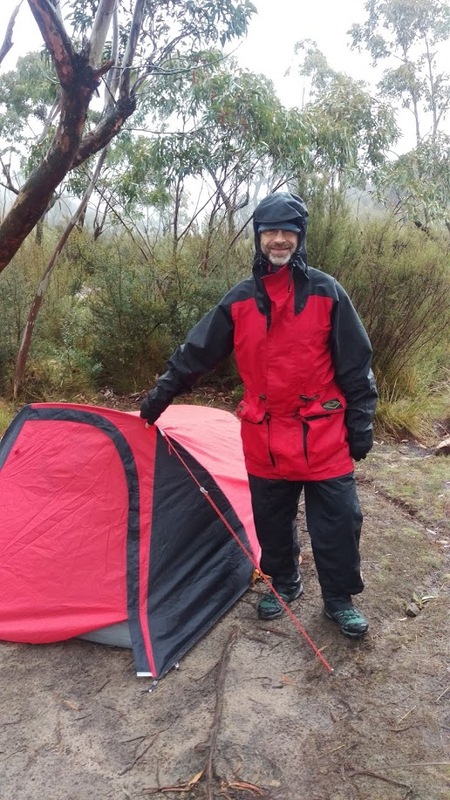 In 2016 we carried a lightweight 2kg tent, including attached groundsheet and fly. Lucky for us it didn’t rain back in the 80’s. Ever. This hike was the reverse, the weather was quite nice as we headed down Mt William, however, half-way up the other side we watched as the mist hid the mountains. The significant event in 1986 was Halley’s comet, hence the black and white photos. 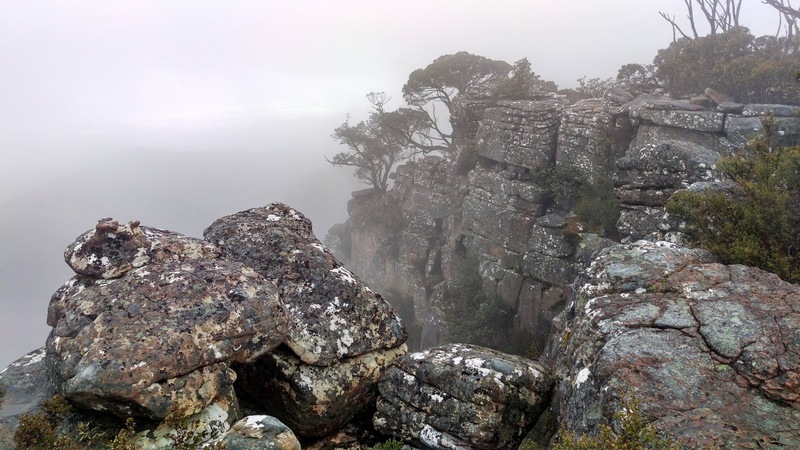 Marcelle lugged her big camera and tripod to the top of the mountain. We took photos of the night sky. I don’t have any of those images. Michael and I took our phones and snapped many photos of the bush, the flowers and each other. No need to have a film developed, instant delete, and much easier to manage. 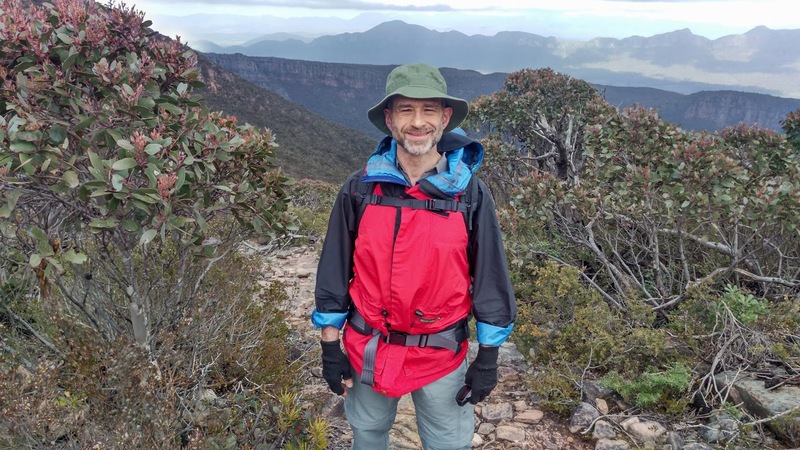 The one thing that hasn’t changed in 30 years is my sheer delight and enjoyment with walking and hiking in the Grampians and sharing that with people who I love. 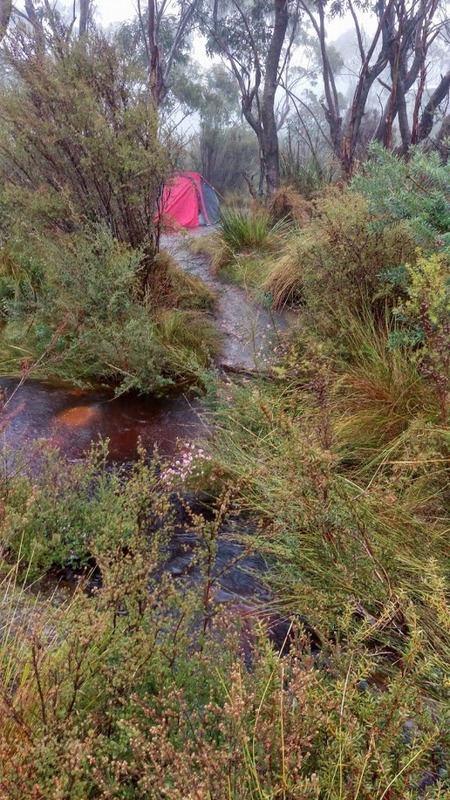 Michael and I have been away for another couple of days in the Grampians. One of my most favourite places. A couple of days there feels like a couple of weeks. One of the things I love about being there is the sheer difference between the macro and the micro. 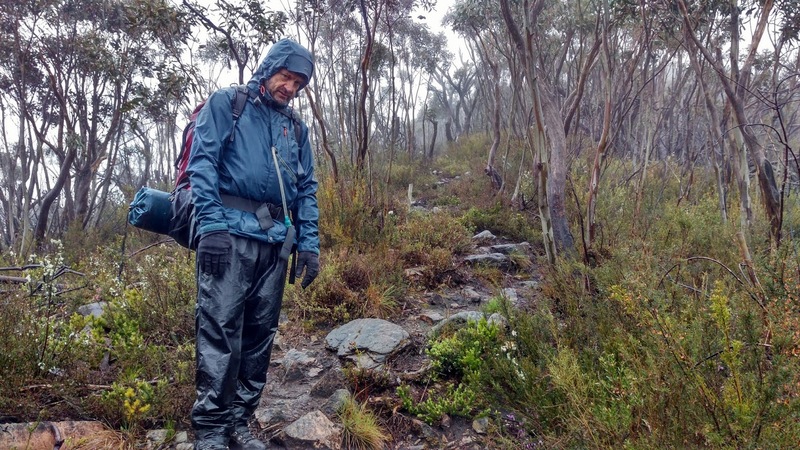 Michael and I walked part of the way up Mt William, the Grampians’ tallest peak. 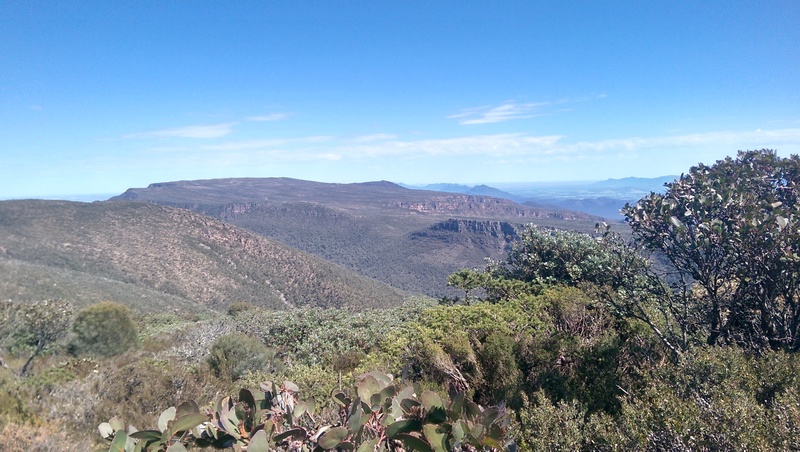 We sat for a while and looked across the Mt William Range to the Major Mitchell Plateau and the Serra Range. An amazing macro view. Our senses are filled with the wondrous view. The warm sun on your faces, the cold wind whistling between the rocks, the smell of eucalyptus trees. Then if you take the time to look closely you can see the micro. You can see the dew clinging on the sun-dew flowers, the droplets glisten in the sunshine. 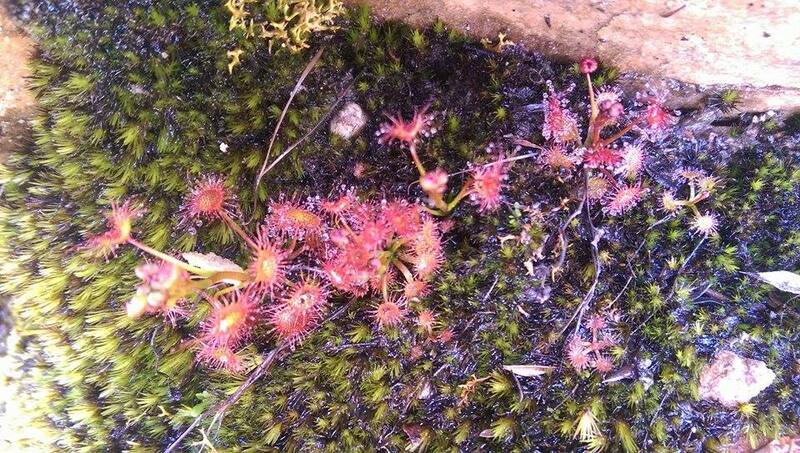 The micro world is getting ready to burst forth with its array of colours as the weather warms up. The orchids are just starting to bloom and they are always a treat. Somewhere between the big mountains and the tiny flowers is the wild life. A treat is the local sulphur-crested cockatoos that visited our room for the chance to nibble on some sunflower kernels. Nothing like a few seeds to bring in a crowd. Each cockatoo has its own personality, this one carefully picks up each kernel to eat, another one would gather 4 or 5 at once, yet another would peck at your hand and others would be gentle. There were some that would approach carefully, headed cocked on one side to keep you in its view and one that jumped on our shoulder to get to the seed. 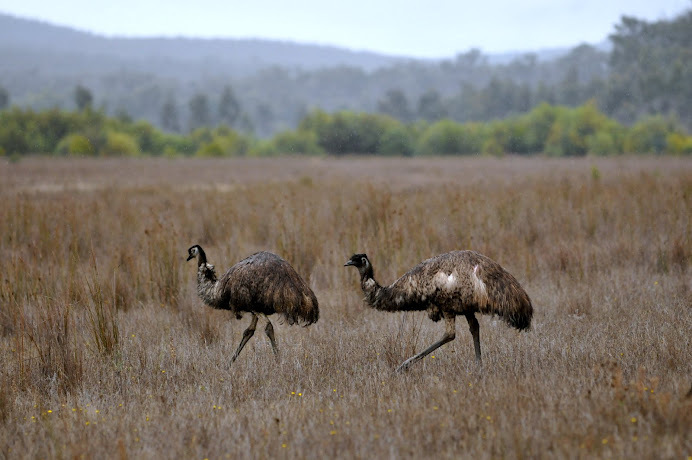 There are always plenty of birds in the Grampians, I could and do stand, stare, point and admire. As we’re walking down from the Picaninny, I can hear some twigs breaking so I stop and listen carefully, slowly spinning my head until I find a family of Gang-gang cockatoos sitting in a native pine eating the nuts. The highlight of the weekend however was the journey home. 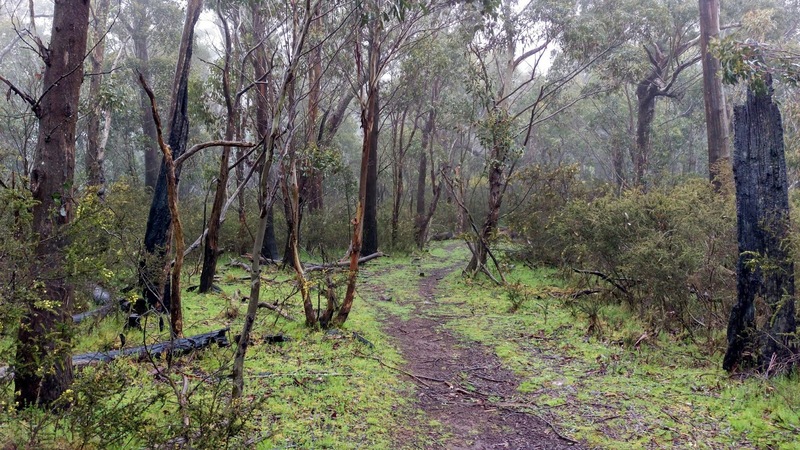 We stopped to take a short walk up Mt Noorat, just out of Terang. It’s a dormant volcano. The crater is an inverted cone. As we walked around the rim a flash of movement caught my eye as I turned my head to the left there was a single flap of wings and I came eye to eye with the wedge-tail eagle. We seemed to make eye contact and he let out a couple of short squawks as he glided past us. We couldn’t believe our eyes. We had seen eagles before, off in the distance. This was close. We watched as he flapped and began to circle, keeping one eye us. It was just amazing. As he circled back around and dipped back below the crater rim we waited for him to reappear. However, not everyone was as excited as us for this moment. As he flew over the tree tops the local magpie clearly thought he was a little too close for comfort. An aerial battle began. It was very one-sided, the eagle not really very interested in the magpie. The magpie would be flapping its wings rapidly and I could hear that swooping noise as it flew towards the eagle. The eagle on the other hand effortlessly flapped twice and kept just ahead of its attacker. With an extra burst of flappiness the magpie managed to catch up and it swooped down on the larger bird and the eagle flapped a couple of times and continued on its way seemingly unconcerned. The magpie continued its assault and saw the bigger bird off. The presence of this bird of prey had the mountain buzzing. The magpies began warbling, and as the eagle circled around the local population of birds began calling out their warnings. Each a delight to look at. 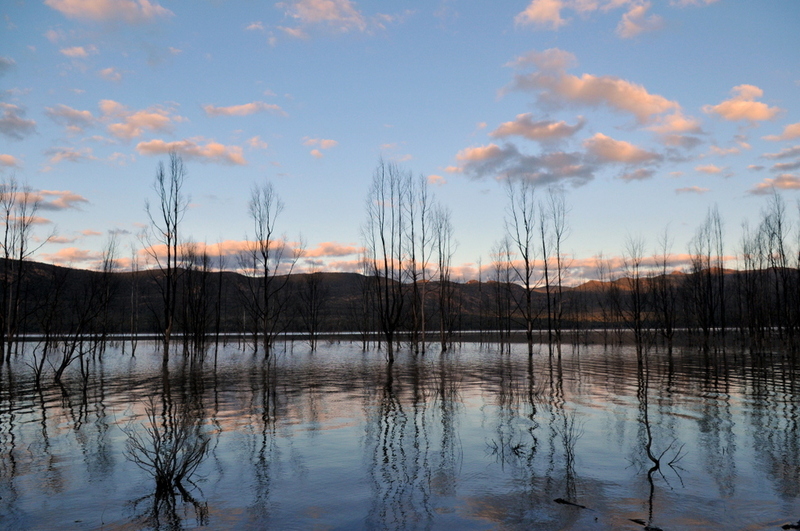 Take some time to flip through Michael’s photos – They are well worth it! 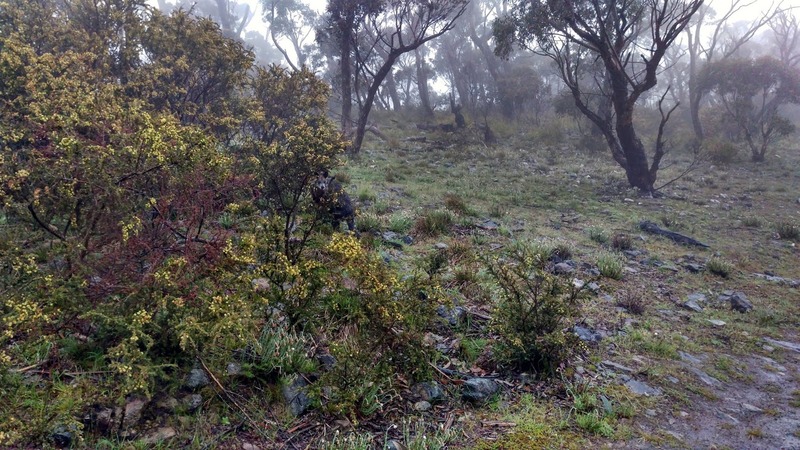 The best place to smell the roses is Halls Gap in spring. Well, smell the wildflowers at least. Michael and I headed up to the Grampians for a weekend recently to do just that, smell the wildflowers and enjoy the great outdoors. We left on a Friday night getting there late. The first thing to strike me is the smell of the trees, then as you step out of the car the amazing array of stars spread across the sky above. I think as I stop to soak it in how the First People who have lived here for over 10,000 years must have often looked up to the sky and looked in awe at the view. The black outline of the ridges that gives way to the brilliance of the stars. The First People called this place Gariwerd. We started Saturday morning with a run from our motel out past Brambuk, the visitors centre, and back, just about 6 kilometres. 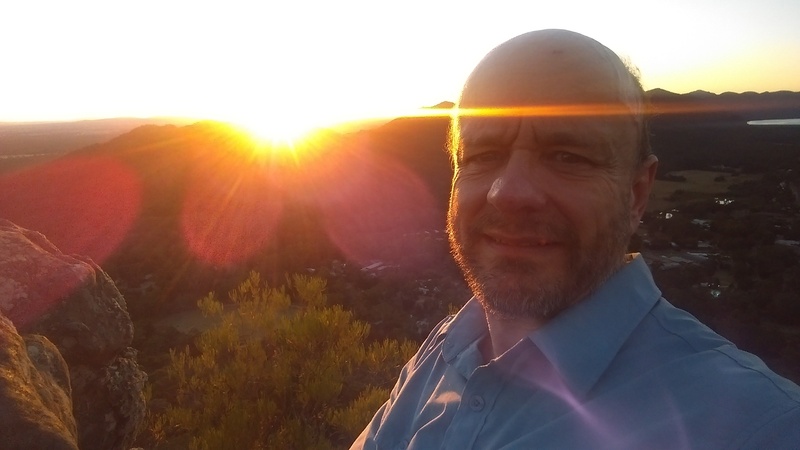 My normal run is several times around the local running track, so to be out in the brilliant sunlight in the cool of the morning surrounded by towering mountains, the smell of eucalypt and the odd mob of kangaroos is a real treat. After our breakfast our first stop is Mt William. 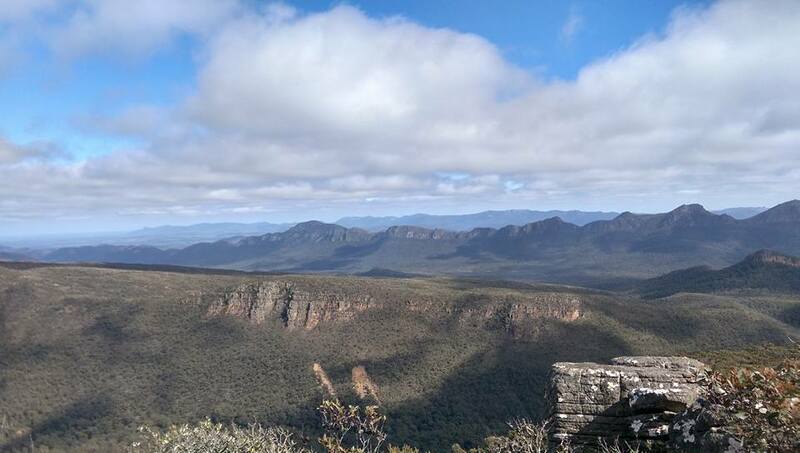 The mountain is the highest peak in the Grampians at 1,167 metres. The mountain reminds me of my youth. 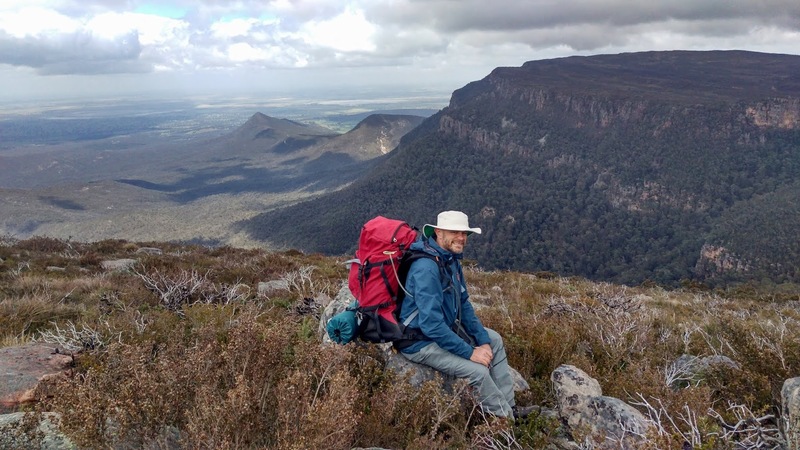 Many times have I climbed to its peak and looked at the fantastic surrounds of the Western District and the Grampians ranges. It’s pretty easy to get to the starting point for our walk. You drive. The fun starts after you get out of the car. It’s just 2 kilometres to the top on a well paved road, however, it’s steep! We wind our way up and around the zig-zag road. The day is beautiful. Bright sunlight, not too hot. Just perfect for a slug up a mountain side. The flora changes as we ascend. 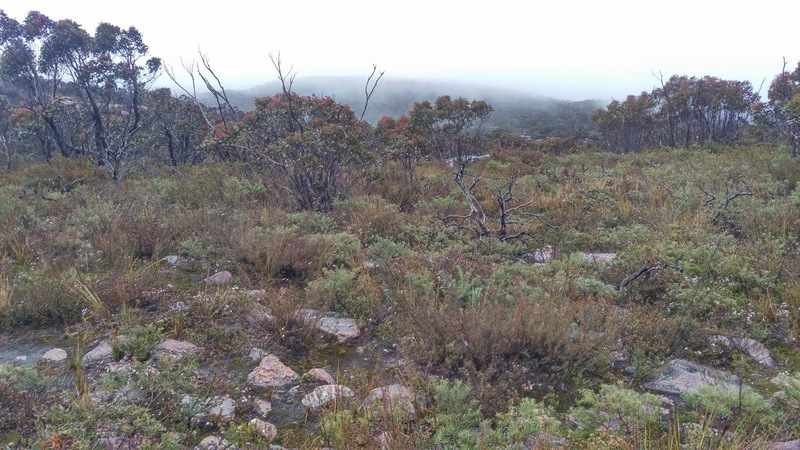 From the tall eucalypts to the stunted bushes of the semi-alpine area. There’s not much to stop the wind at the top as it whistles through the communications tower when we reach the summit. It’s a hard slog, but well worth the effort. We scramble around on the plateau exploring the rocks and taking in the view. We head southwards towards the Major Mitchell Plateau, this is the one spot in the whole world that I want to return to. 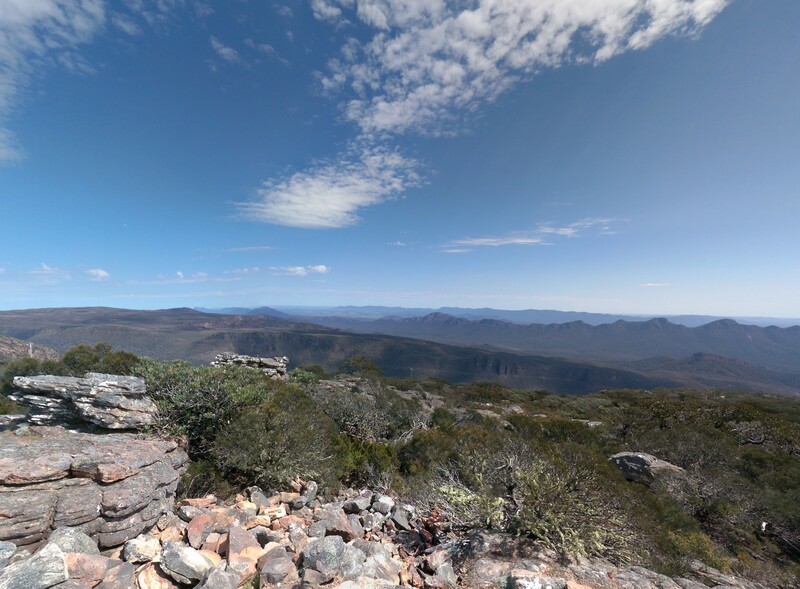 It’s an incredible hike that takes you down the side of Mount William to the valley floor then the steep climb up the side of the MMP. However, that’s an adventure for another day. All I can do is look at it for now. 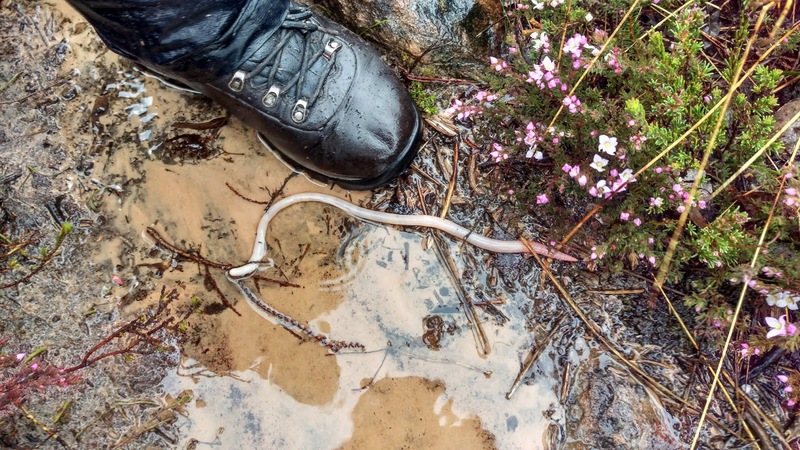 As we head back down the road to our car we pass a few people walking heading up – stopping to take plenty of photos, including a few of a 3 metre snake that winds its way across the road in front of us. Once at the car we head on to Jimmy Creek to stop for a coffee, then onto Mafeking, home of the Grampians gold rush in the early 1900’s. We take a stroll around the old town where once 10,000 people lived. There’s nothing but bush here now, and a few mine shafts that have been covered up with wire mesh barriers to prevent you falling in. Sunday morning dawns even brighter than the previous day. Today is wildflower day. 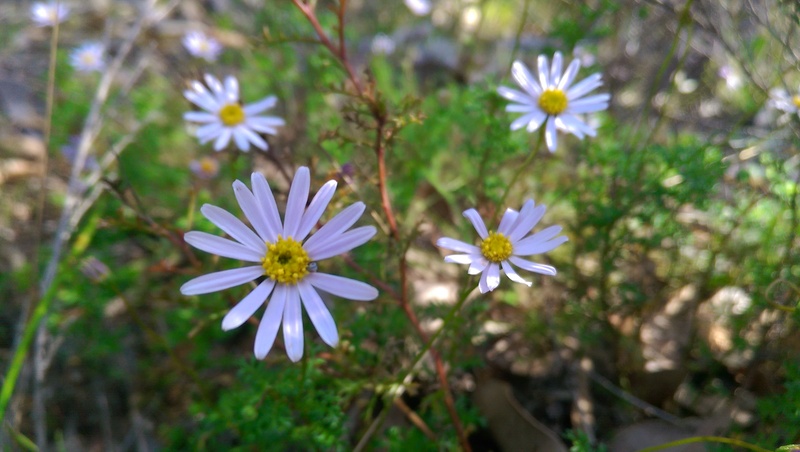 It’s Halls Gap Annual Wild Flower Show, now into its 75th year. First stop is the Botanic Gardens. I had no idea that Halls Gap had such a place. We wander around the gardens and look a the display of wildflowers on show. Mostly cut flowers put into old ice-cream tins. 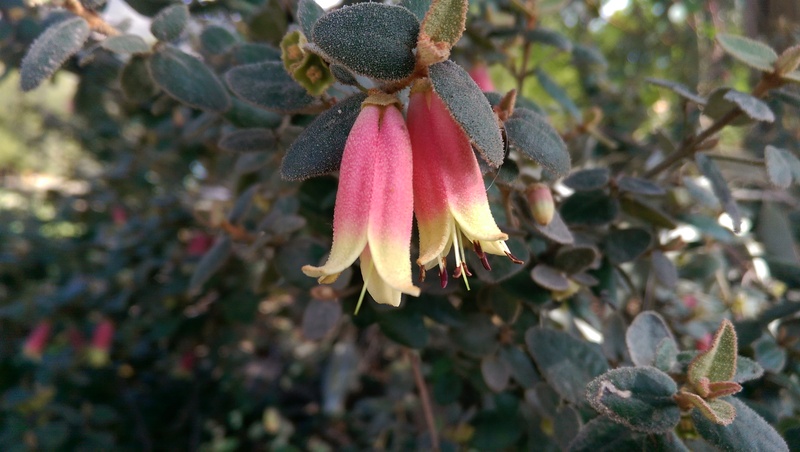 A permit is required to pick flowers in the Grampians, so not something you’d wander around the bush doing for a lovely display on the mantlepiece at home. There’s this fantastic tree in the gardens. A survivor. Be sure to click on the image to the right to see the larger size, note the ice cream tin at the foot of the tree. We wander through the exhibition in the local hall, grab some lunch and then head southwards again to Lake Bellfield. 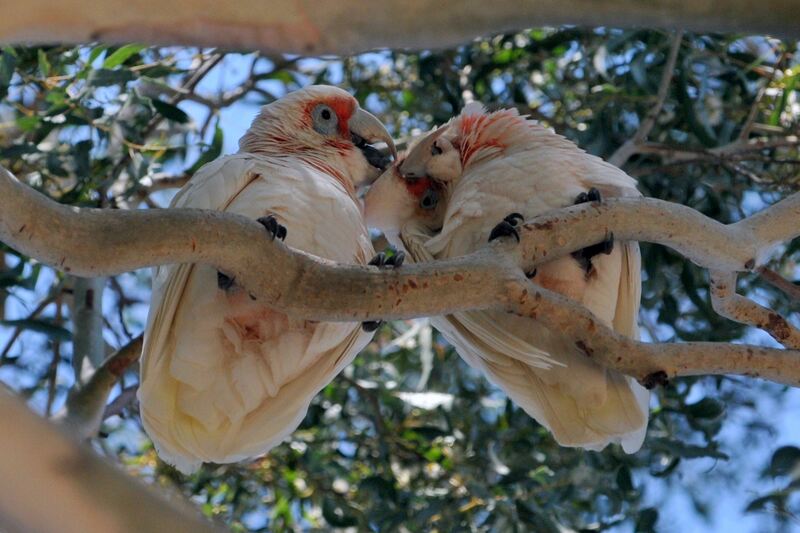 We stop here, as we often do at Dairy Creek, the spot never disappoints with the local corella population taking up residence in the trees and making a fuss that only they can do. There seems to be thousands of the things gathered in the tree-tops. We stop for some photos. As we drive out I’m scanning the sides of the road looking for wild flowers. While it’s great to see the variety on display in an exhibition, what I really want to see is the real thing, flowers in the wild. 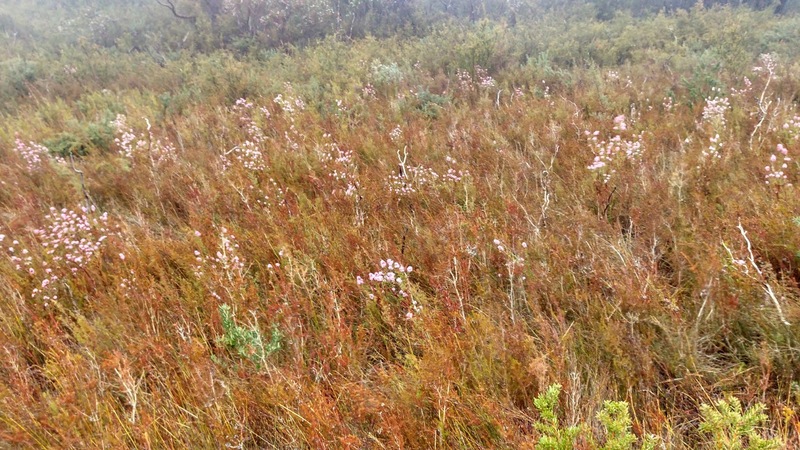 In my mind, looking at wild flowers means grasslands with huge stands of blossoms blowing merrily in the wind. The reality is quite different. The flowers here are tiny. 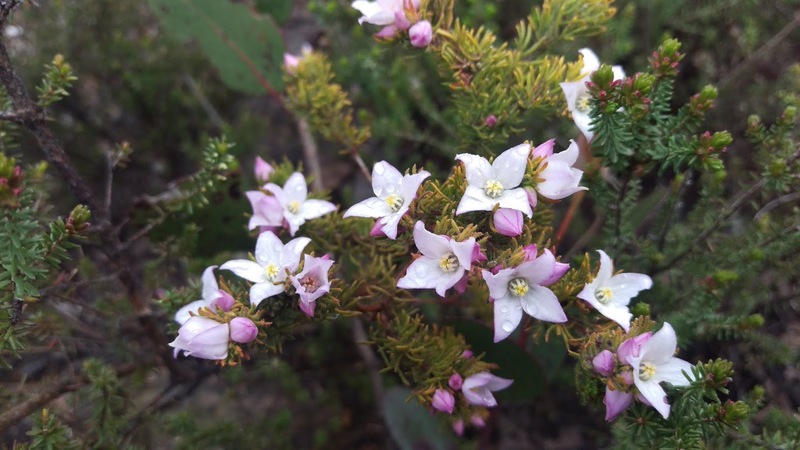 Small delicate blossoms close to the ground and scatter among the dead twigs, leaves and other tiny plants. A flash of red and I stop the car. We get out and wander a few metres into the bush. 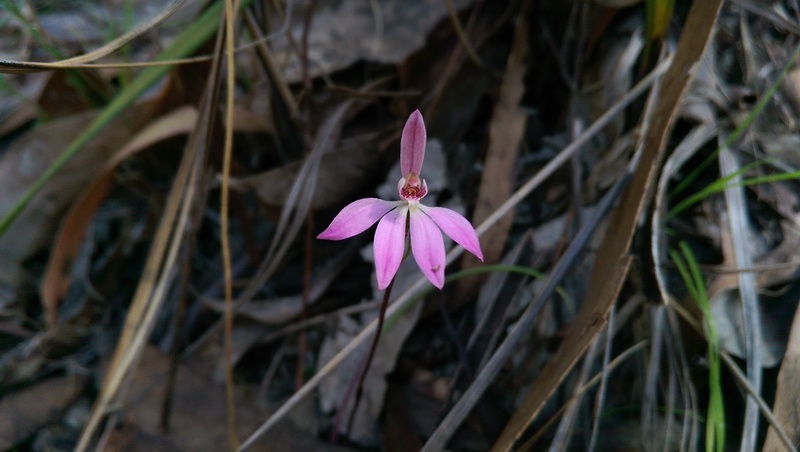 There are the flowers, on the floor, barely 10 centimetres high with tiny flowers no larger than a 10¢ coin on the end of their slender stems. There’s a few here and there and we carefully trod our way through the undergrowth taking great delight in finding the perfect specimen to photograph. kookaburras and the occasional magpie. Another great weekend away in a place that I never tire of visiting. It gives me a sense of mental renewal to be among such staggering beauty with the man I love and the bush I enjoy and admire. A new experience recently, something different, which I always enjoy. 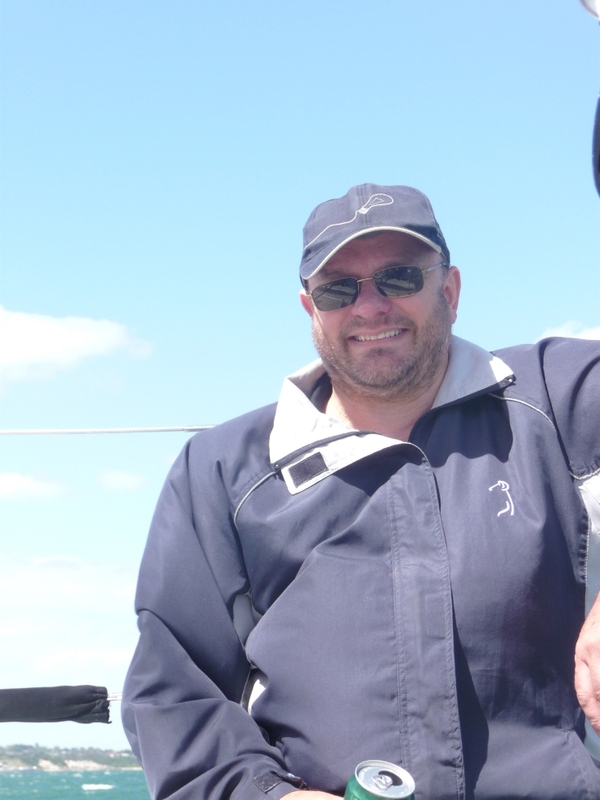 A couple of hours on Port Phillip Bay on 15 metre yacht with my friends and co-workers. Seven of us from work. Some of the other managers had decided that being on the water was a bit scary, so they decided not to join us. There was an air of excitement as we stood at the allotted place at the allotted time. The Sandringham Yacht Club is a large marina with plenty of activity and plenty of boats. 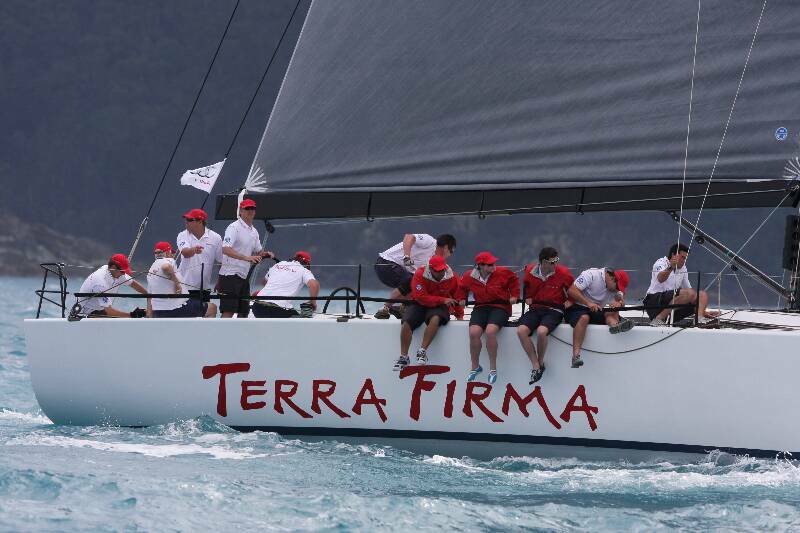 The Skipper of the Terra Firma arrived and took us out to the yacht, it wasn’t as big as I’d hoped, something more the size of the Queen Mary would have kept me happy. We jumped on board and he took us through the safety briefing. Nicholas Bartels, the skipper, was good humoured, making jokes and generally putting us at ease as he worked out who the strongest swimmer was, in case anyone should fall in! He showed us how the life jackets worked and gave us a bit of a run down on his boat. He let us know that he was in charge, and that this wasn’t a democracy, no room for negotiation, if he asked us to do something, it should be done straight away. Once he and a man called Bluey had everything in order, they untied the ropes and with a push off the pier, we were underway. The engine fired up and we gently left the marina. It was a windy afternoon, but the sun was shining and there was an anticipation of excitement and chatter amongst the team as we made our way around the other yachts, boats and other sea-going vessels that you’d never sit in! Once clear of the breakwater it was time to hoist the sail! As it was so windy it was decided to just let the little sail at the front go up as opposed to the big one on the main mast, which I think Nicholas said was about 20 metres high. Don’t you just love my nautical knowledge! I was asked to give a hand, so Nicholas jumped up and ran towards the front of the yacht. There was no way I was running anywhere! I gingerly grabbed the wire that I assumed would keep me in the boat and sort of hunch over and shuffled my way forward. As Bluey guided the sail up the mast I had to pull the rope. At first it was no harder than raising a flag, but then as more of the sail rose, I found I hand to grab the rope and pull hard, bending my knees and almost kneeling. I reckon I could do that once a day, great sailor I’d make. Now the adventure started. I discovered why people get drawn in to sailing. The seven of us had our legs over the side of the boat, doing our bit to keep that side weighed down, and before we knew it we were hurtling through the water at 27 knots. (Which I think is about 50 kph). It was a thrill! The waves saw us rise and fall, the spray stinging our faces and with cries of terror and delight we heading out into the bay. Then it was time to tack, our job was to let go of the security of the wires that we were hanging on to for dear life, and make our way across the other side of the boat. There was only a moment of panic as you look towards the other side and notice that it’s on a hell of an angle, and just below the wires on the other side is the water, it occurs to you that should you not time this just right you might end up in that water. As Nicholas brings the boat around, it levels out a bit and we all scrambled across and ensconced ourselves on the other side, grabbing the wire that we are assured keeps in 14 burly blokes. Now as the boat swings around we are again on the high-end and whipping through the waves. We did this a couple of times. Then bang. We stopped. Just like that. It wasn’t clear what was going on, but we certainly hit something. I eagerly look towards shore. Could I swim that far? Resisting the temptation to go find a life vest, I sat as Bluey and Nicholas calmly talked to each other. Seems we ended up on an unexpected sand bank. Using the motor Nicholas gently rocked the boat backwards and forwards until we fell off the bank and were free! A bit more speed before he turned the boat and headed for home. Now that thrill was over, and the real thrill for the day was about to commence. Out on the water, with a can of beer in my hand and some sandwiches we peacefully sailed through the waters of Port Phillip Bay. Off in the distance I can see the Heads and Arthurs Seat. I can see Half Moon Bay where I spend many of my lunch times looking out at the same spot. Further around is the skyline of Melbourne. I have my friends and colleagues with me as we chat and laugh. Eat and drink. I’m loving it. The stresses and the strains of life float away on the water as I look at the crested terns flying off in search of food. I see a gracious bird with a huge wing span sail off over head. I hear laughter and delight as we gently sail back to the bay. I’m in my element here. Well, not the water as such, but outside, surrounded by nature. There’s the gentle rocking of the boat, the sound of the wind, the bird life and the water. The sun is brilliant and I’m here. I soak up the moment, recalling how grateful I am that right now the universe has reached this place in history and how lucky I am to be here. We slowly make our way back to the club and reluctantly disembarked. Even the surly waitress failed to dampen the high we were on as we sat around the table having a quiet drink, re-living the adventure we’d just been a part of.